We've created this area for you to easily access informative articles, brochures, tools and guides, ensuring that your firm realizes its full potential as a Tributes Funeral Home Partner. Simply click on any of the links below to access and download any of our sales collateral pieces. We will be adding the most up-to-date information on this page to benefit you and ultimately, the families you serve. If you are not already a partner, contact our Sales Team. 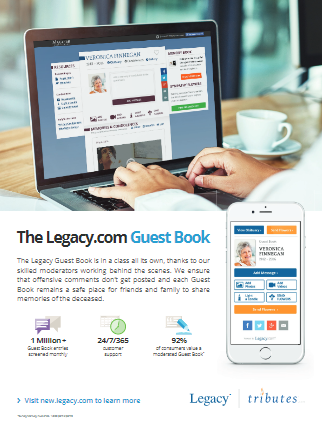 Click here for an excellent analysis of the Legacy.com acquisition of Tributes.com shared with the permission of Funeral Service Insider. Are you using the Tributes Wizard for the first time or just need a quick refresher? The tutorials below will show you how to complete common tasks on the Tributes.com Platform. If you have a question that wasn't answered, please contact TributesSupport@legacy.com.